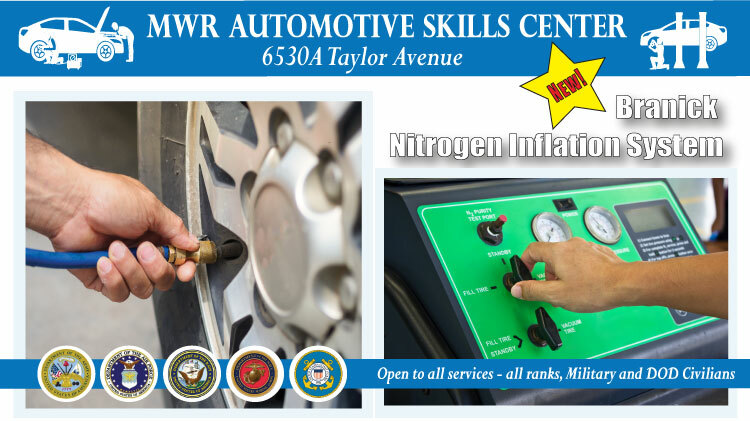 The Automotive Skills Center is offering a February Nitrogen Inflation Special every Thursday in February from 4-7 p.m. Convert all four tires to nitrogen. Cost is only $19.95 for passenger cars, regular price is $30. And $24.95 for SUVs (35+psi), regular price is $35. The Automotive Skills Center is open to all services, all ranks; Military and DoD civilians. Branick Industries has introduced a Nitrogen Tire Inflation System designed to more affordably inflate passenger and commercial tires with nitrogen. According to the company, nitrogen has been proven to better maintain air pressures, lower fuel consumption, and run cooler than tires inflated with oxygen. The company also feels that long-term benefits of the system can include extended tire life and the elimination of oxidation, condensation, and rim rust!